Google has been opening up its wallet a lot lately, but now it is opening its Wallet with a capital W: that is, Google Wallet has officially launched. In a post for the Google Blog, Google Vice President of Payments Osama Bedier officially announced the release of Google Wallet, the company's mobile, tap-and-go payment system. For now, the service will only be available on the Sprint Nexus S 4G, the most recent Google flagship phone. Nexus S owners should see the Wallet app appearing on their phone via over-the-air update and can start paying through their GWallet's Citi MasterCard or Google Prepaid Card very soon. Google Wallet works using the nascent Near Field Communication (NFC) technology, which not all smartphones have been equipped for (sorry, iPhone owners). NFC-enabled devices can transmit small amounts of data simply by being in close proximity with another NFC-enabled device; the technology has been heralded for its convenience and safety and is expected by some to become the standard for all payments in the future. The "Wave and Pay" method of payment was unveiled as a feature of upcoming Windows 8 phones and has long been rumored as a feature to the iPhone 5, and though only the Citi MasterCard is currently available in Google Wallet, the company's blog post on Monday indicated that support for Visa, Discover and American Express could be right around the corner. A full list of smartphones with NFC capability is available here. Google Wallet currently works wherever the MasterCard bump-and-pay PayPass is accepted. 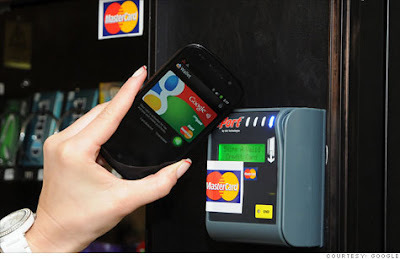 google is persistently coming up with new innovations, running the gamut from autonomous cars to google wallet. Nobody is ahead of google in any way. sure, google is doing a great job.